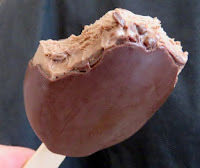 Welcome to Day #9 of Chocolate and Ice Cream Theme Week. While not "ice cream," today's Cashew "Milk" Non-Dairy Double Chocolate Delight frozen dessert (bars) from So Delicious Dairy Free (Eugene, OR) had much of the same creamy texture of a conventional ice cream bar. 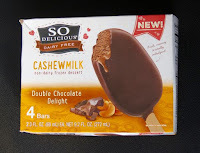 These frozen bars had a rich, chocolate coating and had a slight processed nut flavor. *The company has been dedicated to making dairy-free offerings for 30 years. They also offer coconut, almond and soy "milk" products.